Voxel’s Edge is home to a beautiful world filled with the creations of our talented and dedicated members, and it’s only 2 weeks old. Everyone is welcome to join us and embark on new adventures. Our overworld and nether are a whopping 30,000 x 30,000 blocks. In the overworld, there is a 10,000 x 10,000 block safezone in which PvP is not allowed–this is where many of our members play standard, semi-vanilla SMP. Beyond the safezone exists The Wilderness, teeming with danger. While you may protect your builds and belongings, PvP is allowed in The Wilderness. Our staff create and curate exciting events, such as parkour jumping puzzles, fishing competitions, and more. We also feature our players’ builds on our website. If you build something awesome, we want to know about it! We offer avenues of monetary contribution but only reward them with cosmetic benefits. 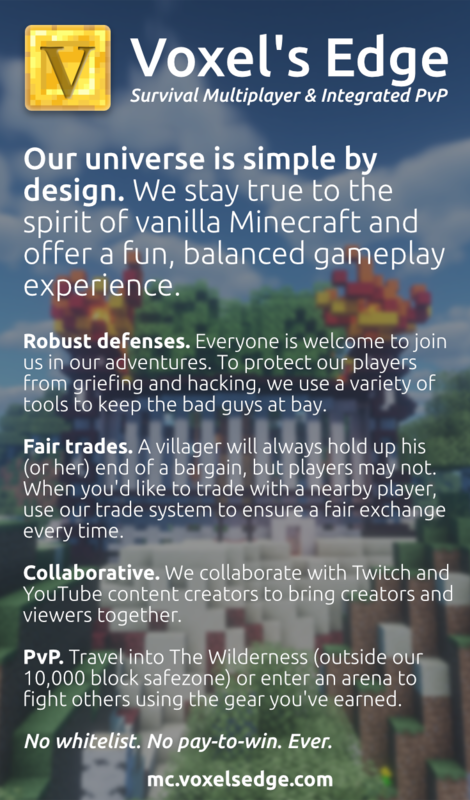 Voxel’s Edge will never offer pay-to-win features. There will never be a whitelist. Our server is a beefy dedicated machine powered by the blood of unicorns. 4.7 GHz processor, 64 GB RAM. 24-hour uptime (barring maintenance for updates or bugfixes). Be respectful. Keep it family-friendly. Don’t modify the builds of others or take their items without permission. Don’t use hacks or exploits that would give you an unfair advantage. Have fun and build great things together!